In this blog post, we will look at how we can configure multiple transport receivers and senders with WSO2 ESB and configure a proxy service to have multiple transport receivers. In order to test our scenario, we need to start two message broker instances. 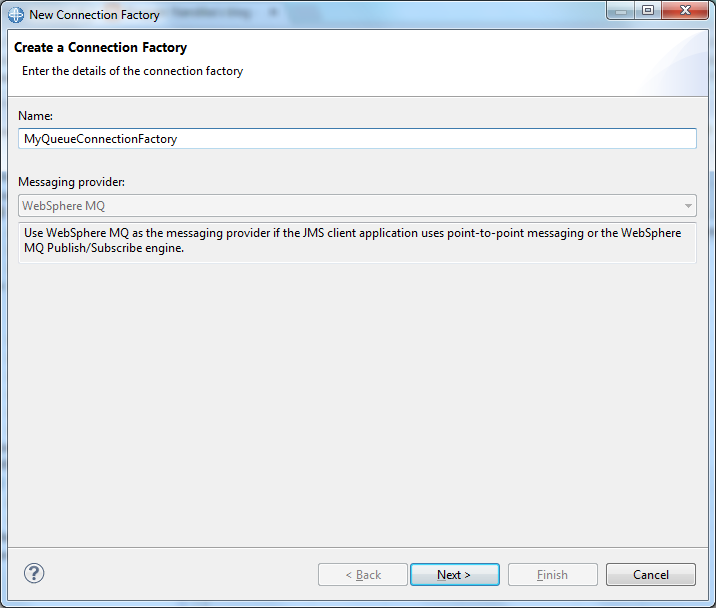 Lets configure active MQ to run as two instances. 1. Download activemq and extract it. 2. Run the following command to create an instance of it. Running these two commands will create two directories inside activemq bin directory with configuration files and start-up scripts duplicated within them. Now we can modify the configuration files to use different ports so that when we start the two mq instances, there wont be port conflicts. Open InstanceB/conf/activemq.xml file and modify the ports under transportConnectors. Now open jetty.xml in the same directory and modify the ui port from 8161 to different port. Now we are ready to start the two activemq instances. Now we have two activemq instance running in console mode. 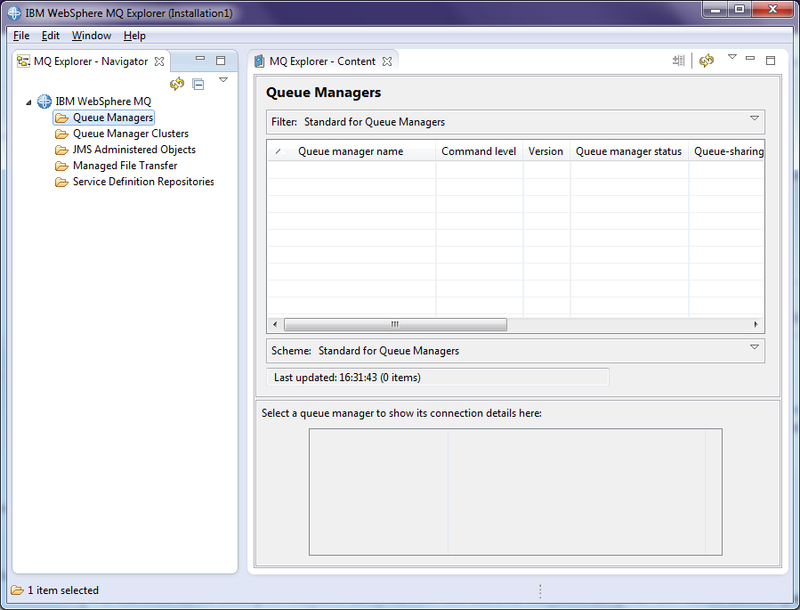 Log into activemq instanceA ui and create a queue named MyJMSQueue. 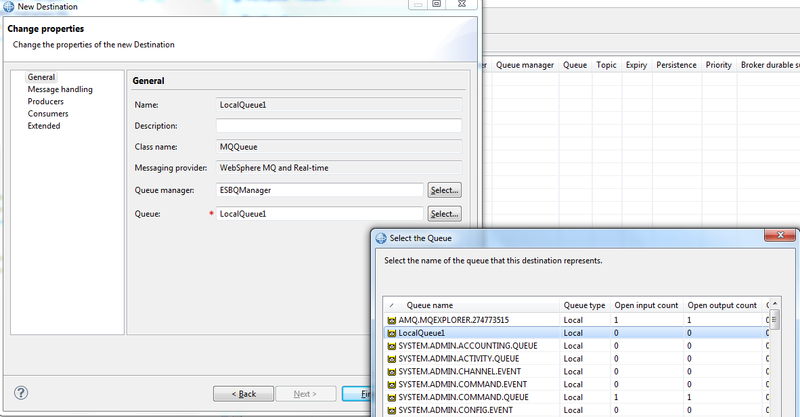 Similiary, log into activemq instanceB and create a queue with the same name. Use http://localhost:8161/admin and username and password admin for defaults. Now, we have done our configurations for activemq broker. Now copy the following jar files to repository/components/lib directory of ESB. Now go to repository/conf/axis2/axis2.xml and uncomment jms transport section for activemq and duplicate it with a transport named jms1. Make sure to update the provider url port with the value you specified in activemq.xml. My configuration looks like the following. Now start ESB and deploy the following proxy service. 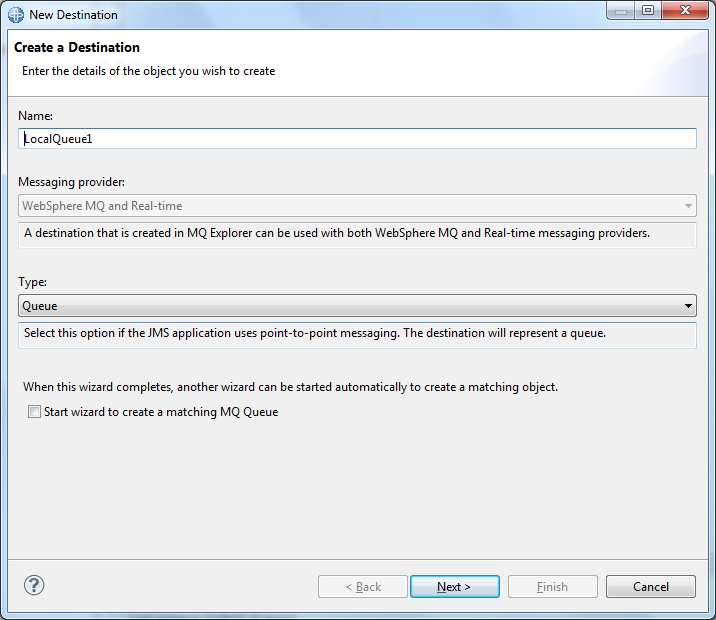 Now if you publish message to queue MyJMSQueue of either activemq instance, you will notice that the message is consumed by our proxy service and logged. 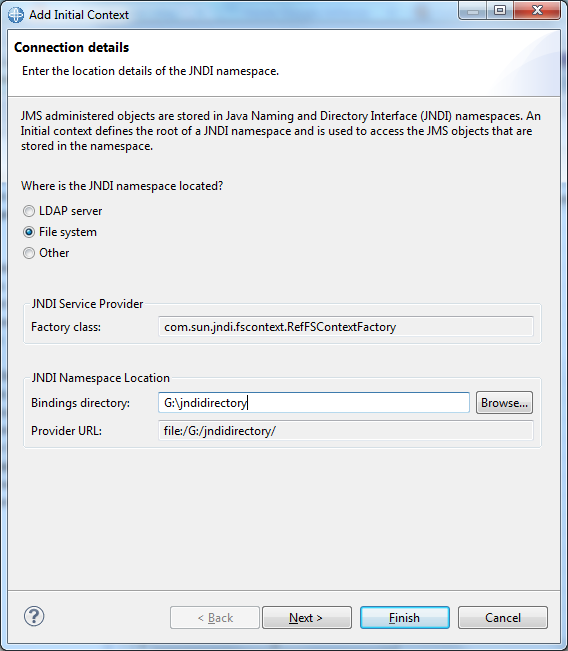 In our scenario, since we are going to have to have different configurations for transports jms and jms1, we cannot specify the connection factory details in the proxy service itself. Hence we have resorted to use the default configurations specified in the axis2.xml. However, we can specify the jms destination name in our proxy service. This make sense as this kind of approach would only be required for mq high availability scenario and hence we can afford to have the same queue name for both message broker instances. 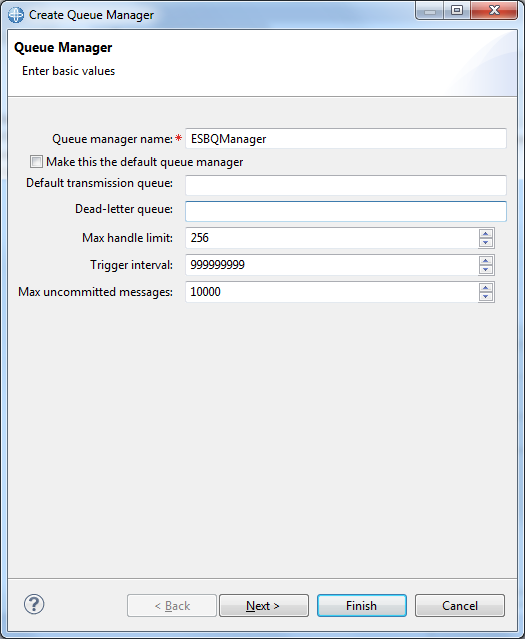 In this blog post, we will look at how to configure IBM MQ version 8 with WSO2 ESB and implement a proxy service to consume messages from a queue in IBM MQ. Following are the steps we need to follow in order to configure ESB and implement our proxy service. 1. 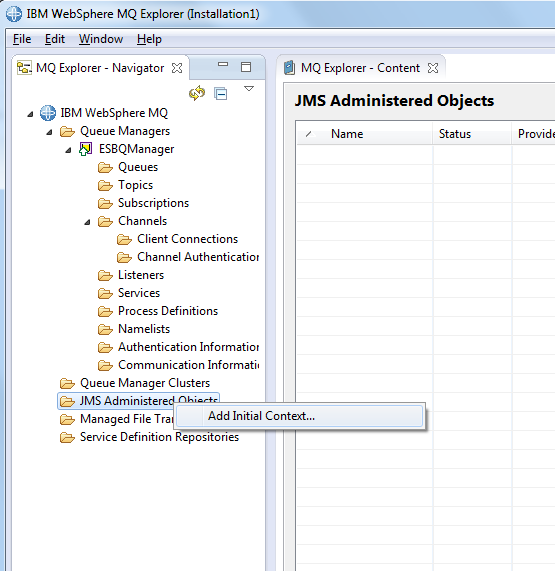 Create the relevant JMS Administrative objects in IBM MQ. 3. 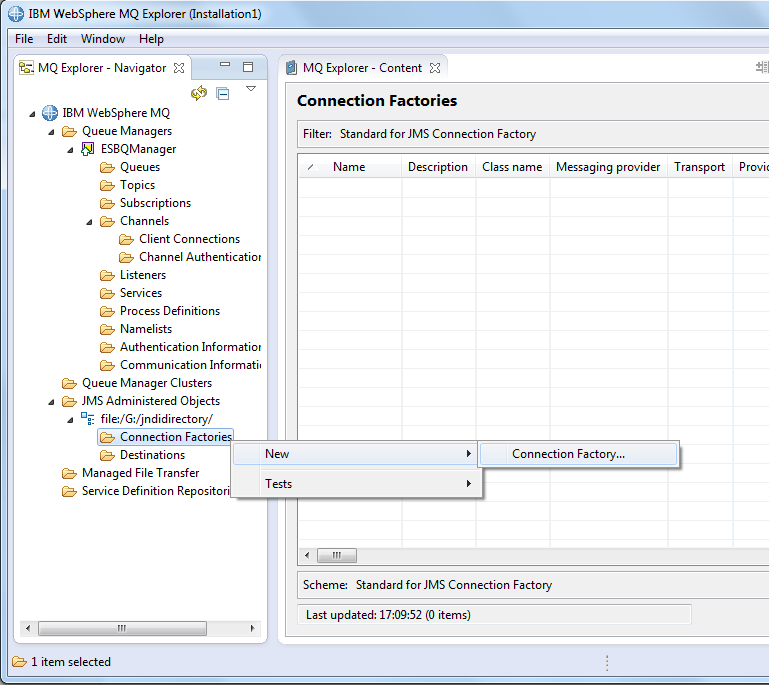 Configure WSO2 ESB JMS transport with the generated binding file and connection factory information. 4. Implement the proxy service and deploy it. 5. Publish a message to MQ and observe how it is consumed by ESB. 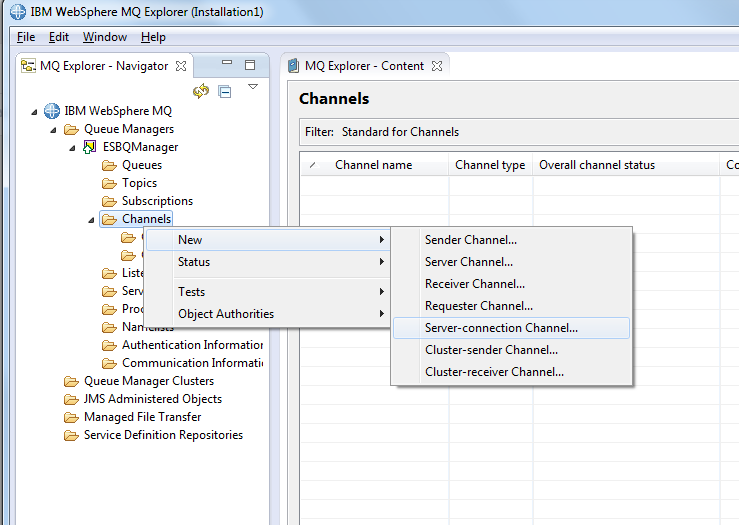 Start the Web Sphere MQ Explorer. If you are not running on an administrator account, right click on the icon and select Run as Administrator option. 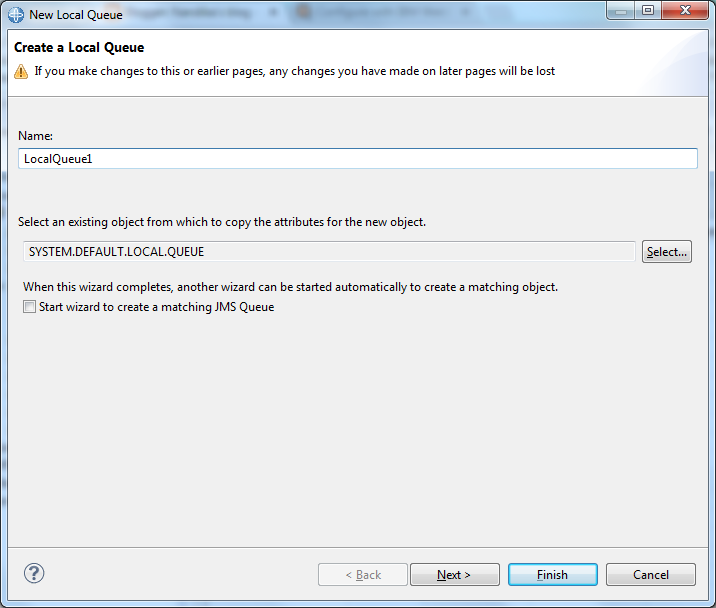 Click on the Queue Managers and Select New => Queue Manager to create a new queue manager. We will name the queue manager as ESBQManager. 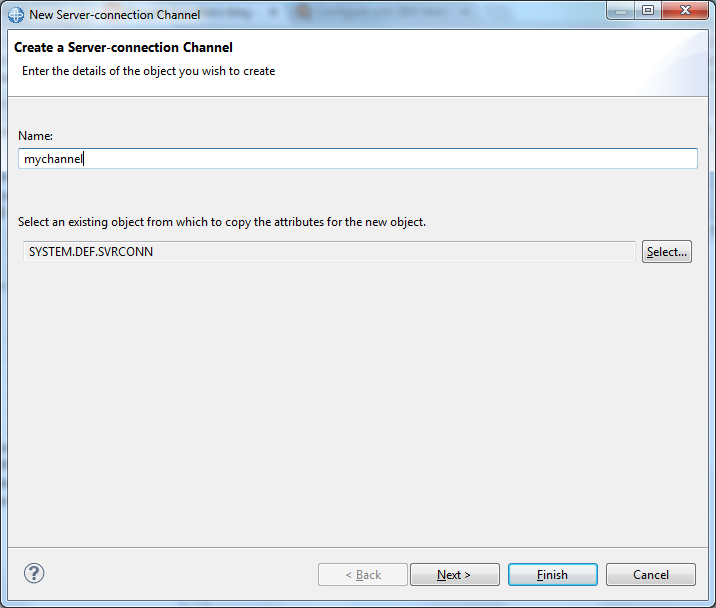 Select create server connection channel option as you pass through the wizard with next button. 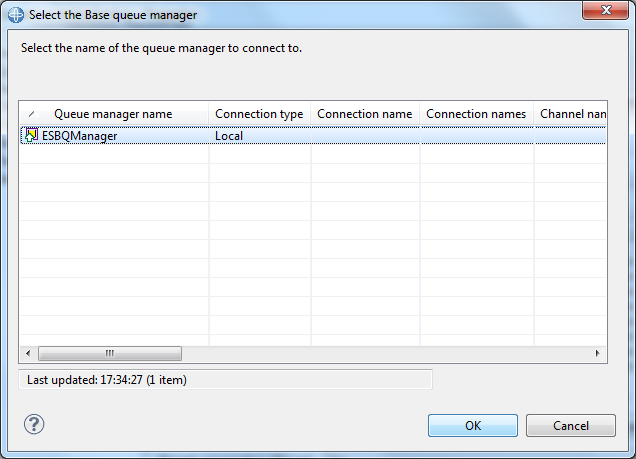 You will get the option to specify the port this queue manager will use. 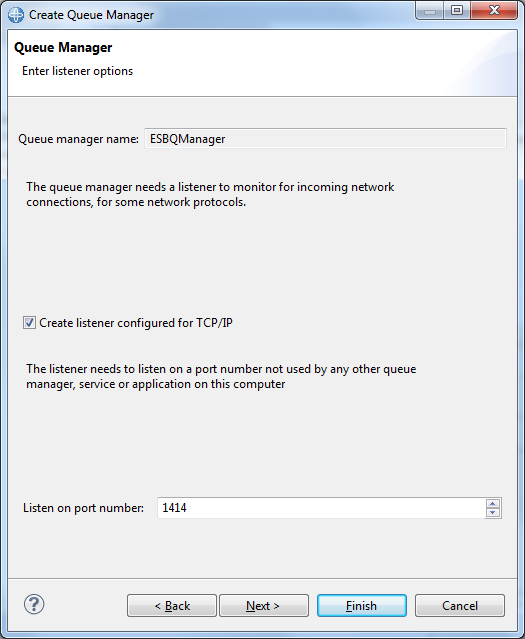 Since we do not have any queue managers at the moment, we can use the default 1414 port. 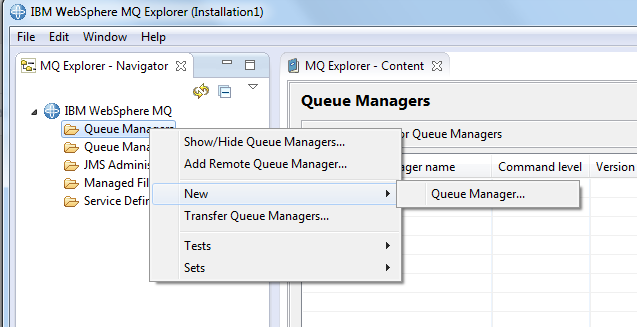 Now we have created a queue manager object. Next we need to create a local queue which we will used to publish massages and consume from ESB. Lets name this queue as LocalQueue1. 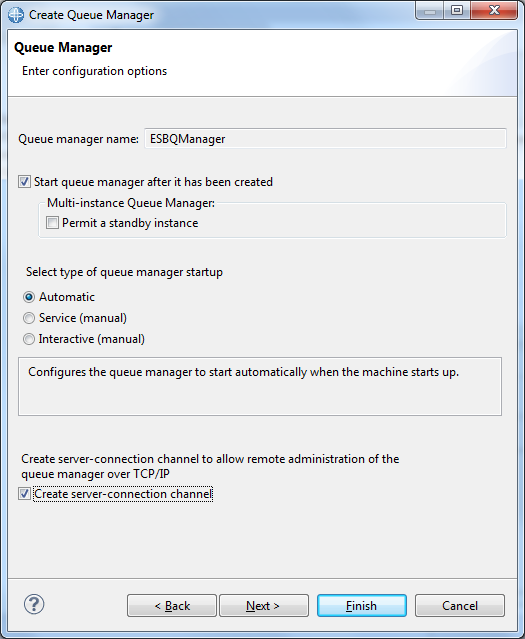 Expand newly created ESBQManager and click on Queues and select New => Local Queue. We will use default options for our local queue. Next we need to create a server connection channel which will be used to connect to the queue manager. Select Channels => New => Server-connection Channel option and give the channel name mychannel. Select default options for creating the channel. Now we have created our queue manager, queue and server connection channel. Next we need to generate the binding file which will be used by IBM MQ client libraries for JNDI Look-up. 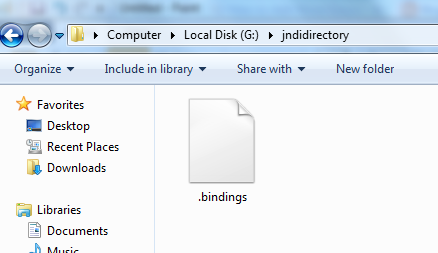 For that, we need to first create a directory where this binding file will be stored. I have created a directory named G:\jndidirectory for this purpose. 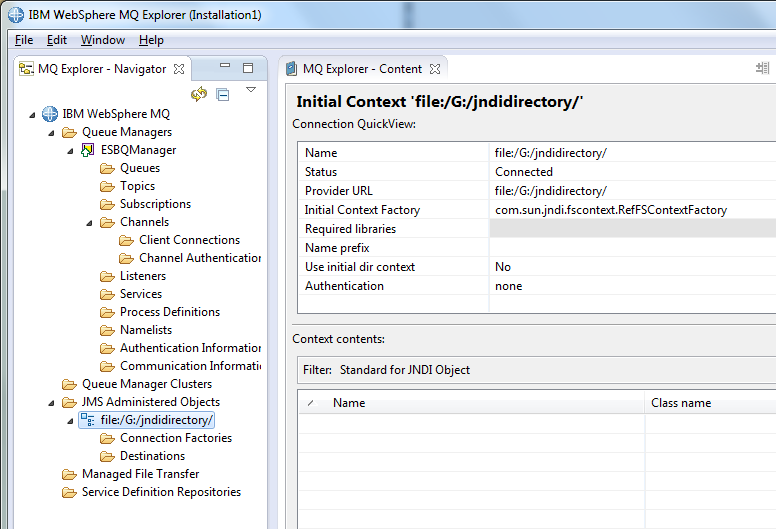 Now go to MQ Explorer, click on JMS Administered Objects and select Add Initial Context. In the connection details wizard, select File System option and browse to our newly created directory and click next and click finish. 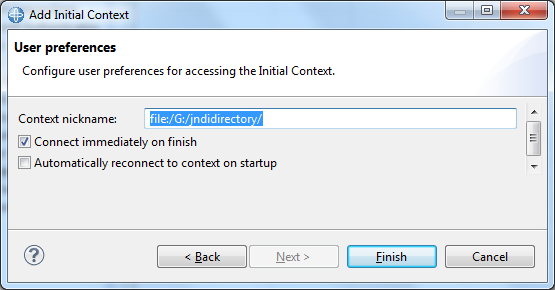 Now, under the JMS Administered objects, we should be able to see our file initial context. 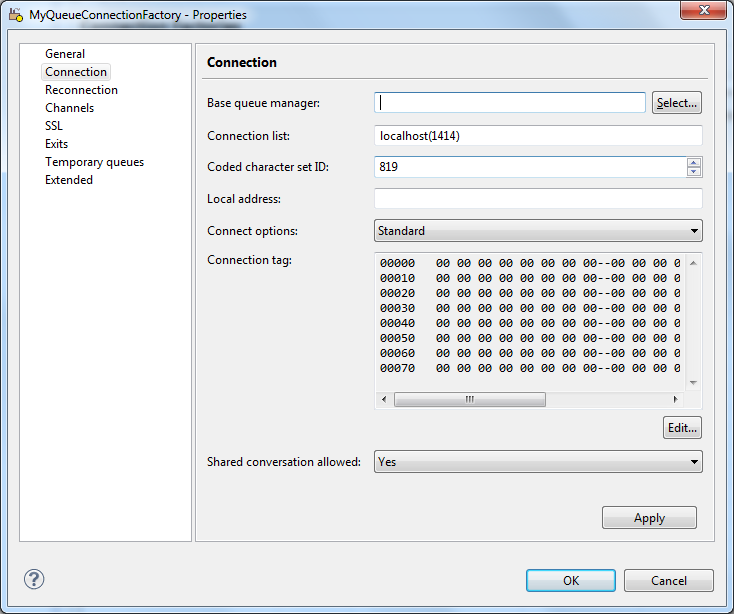 Expand it and click on Connection Factories to create a new connection factory. We will name our connection factory as MyQueueConnectionFactory. 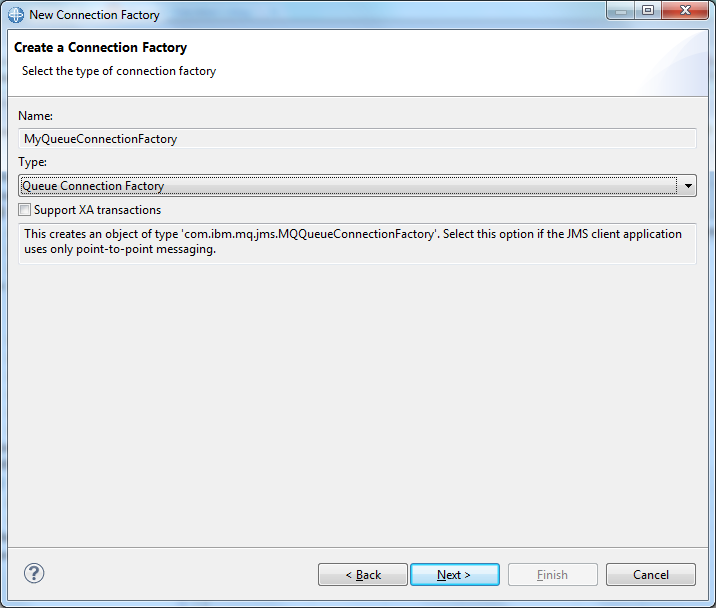 For the connection factory type, select Queue Connection Factory. Click next and click finish. Now Click on the newly created Connection Factory and select properties. Click on the connections option, browse and select our queue manager. 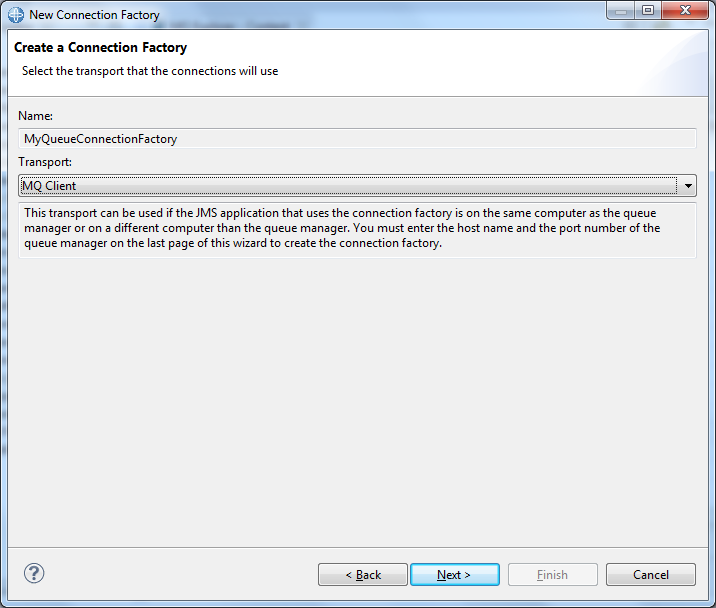 You can also configure the port and the host name for connection factory. Since we used default values, we do not need to do any changes here. For the other options, go with the defaults. Next , we need to create a JMS Destination. We will use the same queue name LocalQueue1 as our destination and map it to our queue LocalQueue1 . Click on Destinations and select New => Destination. and provide name LocalQueue1. When you get the option to select the queue manager and queue browse and select ESBQManager and LocalQueue1 . Now we are done with creating the Initial Context. If you now browse to the directory we specified, you should be able to see the newly generated binding file. In order to connect to the Queue, we need to configure channel authentication. For the ease of use, lets disable channel authentication for our scenario. For that run the command runmqsc from the command line and execute the following two commands. Note that you have to start command prompt as admin user. Now we are done with configuring the IBM MQ. Configuring WSO2 ESB JMS Transport. open axis2.xml found in wso2esb-4.8.1\repository\conf\axis2 directory and add the following entries to it near the commented out jms transport receiver section. Similarly add jms transport sender section as follows. 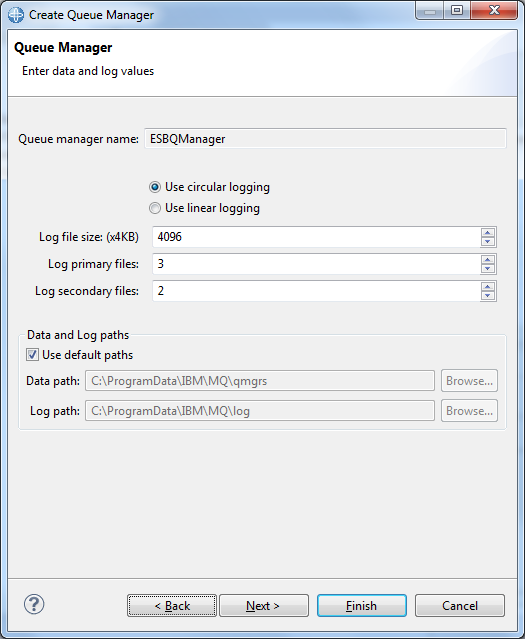 Since we are using IBM MQ queue manager default configuration, it is expecting username password client authentication. Here, the username and password is the login information of your logged in operating system account. Copy MQ client libraries to respective directories. Copy jta.jar and jms.jar to repository/components/lib directory. Copy com.ibm.mq_2.0.0.jar and fscontext_1.0.0.jar to repository/components/dropins directory. Download the jar files from here. Now start esb and deploy the following simple proxy service. This proxy service act as a listener to our queue LocalQueue1 and when ever we put a message to this queue, the proxy service will pull that message out of the queue and log it. 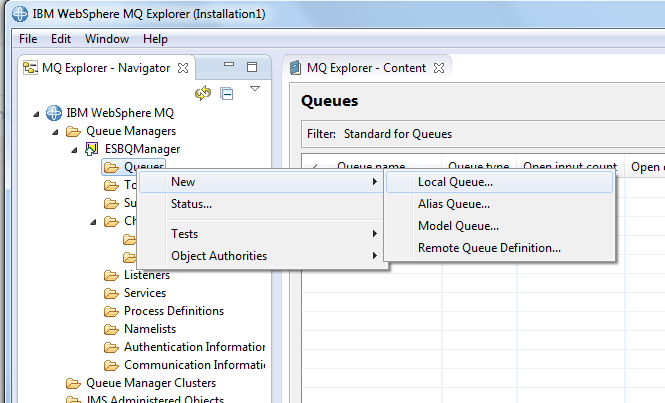 Go to MQ Explorer and add a message to local queue. Now you will be able to see the message logged in ESB console as well as in the log file.